As the Western Hockey League trade deadline passed at 3 p.m. Wednesday, the teams involved in the shopping frenzy were able to finally catch their breath. 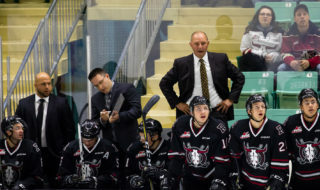 The Red Deer Rebels weren’t one of those teams, although GM/head coach Brent Sutter was an interested observer as some big names changed addresses. The Brandon Wheat Kings moved Kale Clague and Tanner Kaspick to Moose Jaw and Victoria, respectively, Dennis Cholowski was dealt from Prince George to Portland and the Regina Pats, Saskatoon Blades and Medicine Hat Tigers hooked up in a three-way transaction (see whl.ca). In return for the big names, the deals involved young roster skaters/top prospects and a multitude of high bantam draft picks. “It was a quiet deadline for us,” said Sutter. “We sat back and watched everything else transpire around the league. “It’s been wild, it’s been crazy. Part of it I think is there was just a lot of buyers this year and the market dictated the prices. It started slow early but then it just kept getting bigger and bigger and bigger right up to the last minute before the deadline, with the big trades Brandon made. Sutter swung a minor deal Monday when he got a sixth-round pick from Portland for Lukus MacKenzie. 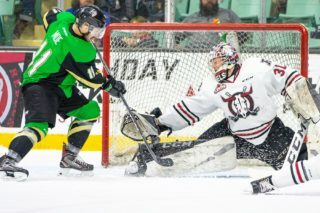 All of his heavy lifting was done in previous weeks, with several veterans moved out — including Lane Zablocki, who went to Lethbridge and on Wednesday was dealt to Victoria — and various younger players brought in. The fact of the matter is that the Rebels boss decided roughly a month ago to get a jump start on a rebuild, a necessary process after hosting the Memorial Cup tournament in 2016. The original plan was to start the rebuild next season. “We thought coming out of the Mem Cup that we would be in a situation where it would be Year 3 (after hosting the tournament) when we would have all these young players coming in, because the key group was going to be our 15-, 16- and 17-year-old players,” said Sutter. “But we didn’t have a great start to the season and when it got into the month of November I figured that we would give it until Dec. 10, that was my deadline, to see where it was going to go. The Rebels, in the process, replaced the veterans with the likes of 16-year-olds Arshdeep Bains and Alex Morozoff, while also adding Josh Tarzwell and Colin Paradis in trades. Also coming back to Red Deer were numerous draft picks. “We started acquiring more draft assets and we were able to add a couple of (experienced) players into our lineup in Tarzwell and Paradis,” said Sutter. “It’s certainly been a very interesting few weeks. “That being said, I certainly like our future here, and I like the present with all the young kids playing, although we’re going to go through some tough times, some trying times. Sutter admitted that he fielded last-minute inquiries regarding some of his older players, but in the end decided that his first- and second-year performers needed the presence of the remaining veterans as a means of insulation/support. The Rebels won’t be getting any older next year, not with the likely inclusion of forwards Zak Smith, who is currently with the junior A Neepawa Natives of the MJHL, and Ethan Rowland and Jordan Borysiuk, playing at the midget AAA level as 15-year-olds. 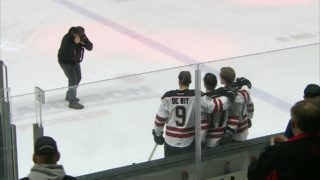 They’ll simply add to the younger talent already on the Red Deer roster. “Next year they’re all the same. Even the young kids here now will have to prove in training camp that they belong here, and the kids coming in will have to do the same,” said Sutter. Moving forward, the Rebels could be big winners through the draft, depending of course on how many they actually use in the annual event. 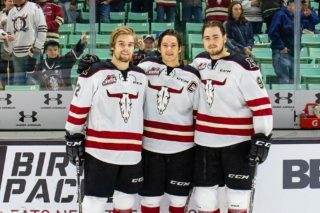 As it stands, Red Deer has two first-rounders this year, along with second and a couple of thirds, a first, three seconds and a third in 2019, and a first and two seconds the following year. “We’re certainly lined up well with our draft picks, although I’m not saying that every pick will be used in the draft,” said Sutter. 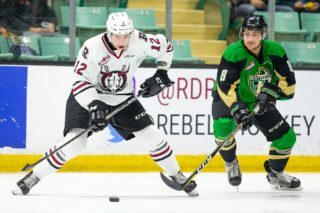 Notable: The Rebels did make a minor move Wednesday when defenceman Sam Pouliot was reassigned to the Powell River Kings of the junior A BCHL. Pouliot was in his first season with the Rebels and recorded one point — a goal — in 12 games . . . The Rebels return to action Friday and Saturday with home games versus Lethbridge and Saskatoon.